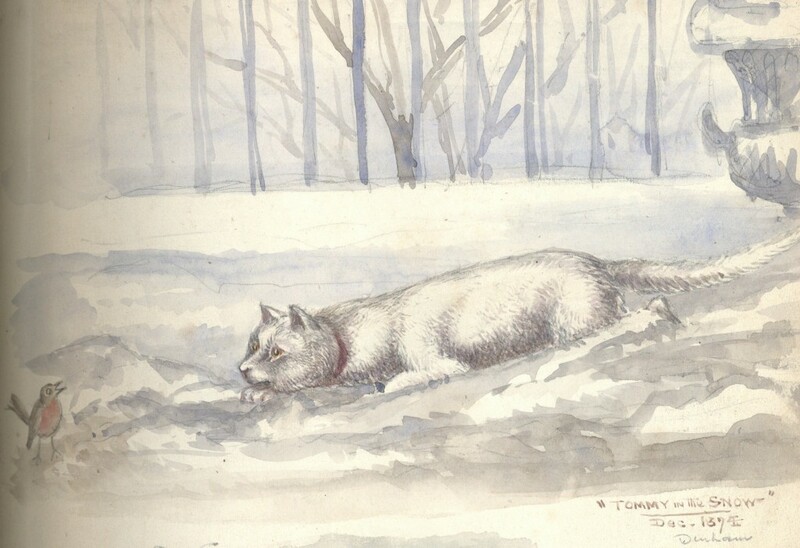 Find “Tommy in the Snow” from the Crawhall Album JC/6/2/8 for yourself here. Joseph Crawhall II (1821-1896), was a businessman, artist and patron of the arts. His artistic achievements including wood engraving, watercolours and contributions to Punch magazine. The pursuits of himself and his family contributed to the thriving cultural environment of 19th Century Newcastle. Not only contributing to the cultural heritage of Newcastle through his own artwork, Crawhall also promoted the arts through his role as a Secretary for the Arts Association of Newcastle upon Tyne and through his continuing efforts to preserve local architecture. Find out more about the Crawhall Collection here. This entry was posted in #SpecCollAdvent and tagged #SpecCollAdvent, Cat, Christmas, Crawhall, Robin, Snow by nspeccoll. Bookmark the permalink.